Pebble’s first color smartwatch is taking a page from Google Now, with a “Timeline” view that tells users what’s coming up next. The new smartwatch is called Pebble Time, and its color e-paper display supposedly matches the week-long battery life of current monochrome Pebble watches. In addition to the color display, the watch includes a microphone for taking notes or replying to messages by voice. As before, Pebble connects to iOS and Android phones over Bluetooth, relying on the phone for all Internet and cellular functions. We haven’t seen Timeline in action yet, but it sounds somewhat similar to Google Now, the virtual assistant that automatically provides timely information on phones and Android Wear smartwatches . But while Google Now naturally offers up Google’s own services, such as Search and Gmail, Pebble is turning to third parties like The Weather Channel, ESPN, Jawbone, Evernote, and Pandora. As for the look of the Pebble Time, it resembles the unflattering render that popped up on Monday, but with a little more contrast coming from the stainless steel outer bezel. The watch has a curved design that’s mostly covered in plastic, and while it’s 20 percent thinner than the original Pebble, it appears somewhat wider. 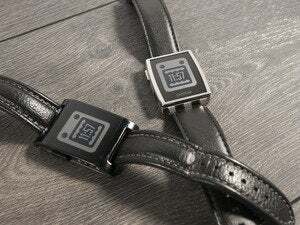 Over time, it sounds like Pebble wants to add more capabilities through smart watch bands. The Pebble Time’s strap will have a quick-release mechanism and a smart accessory port, letting third parties attach their own sensors, but it’s unclear what sort of features this will enable. The Pebble Time will go on sale later this year for $199, but for now, Pebble is turning back to its Kickstarter roots for a pre-sale. Fans can order the Pebble Time in three colors—black, white, and red—for $159 through the crowdfunding site, with delivery expected in May. The story behind the story: With Apple set to release its own smartwatch in April, the timing of Pebble’s announcement seems like more than a coincidence. 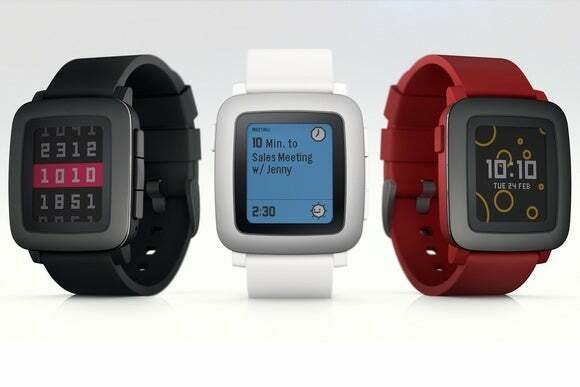 The company is likely trying to rally its most devoted users before a major competitor steps onto the scene, and going back to Kickstarter is a convenient way for Pebble to tip its hand a few months early. Pebble continues to prioritize battery life and an always-on display, but now it has a few more features to keep people from defecting to more powerful smartwatches.